With version 2.0, we’re introducing a ton of new features that you’ll be sure to enjoy and use! Support for GT Boilerplate Bold. Primary menu sub–menu link adjustment. Support for all GT school logos from the Customizer. Georgia Tech logos now link to their corresponding departments, units. Refactoring of footer, header, and logo PHP code. Let’s take a second and go into the biggest change to GT Boilerplate since, well, the start. 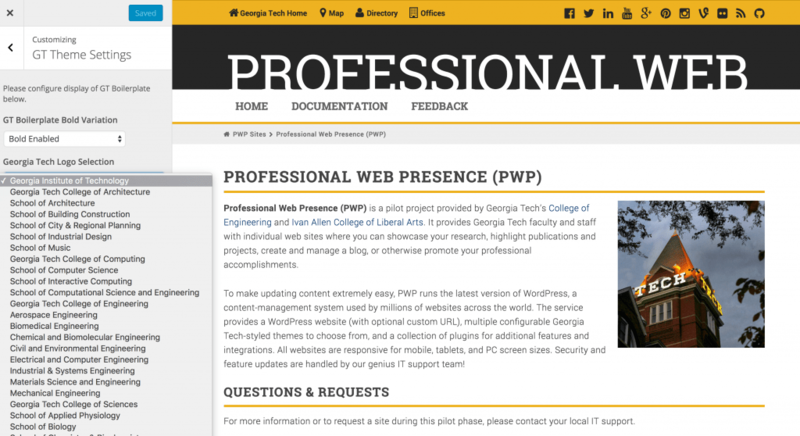 GT Boilerplate Bold is the PWP equivalent of research.gatech.edu. It is a radical way to change the look of your website, add some variation, and present your web content to a general campus audience. 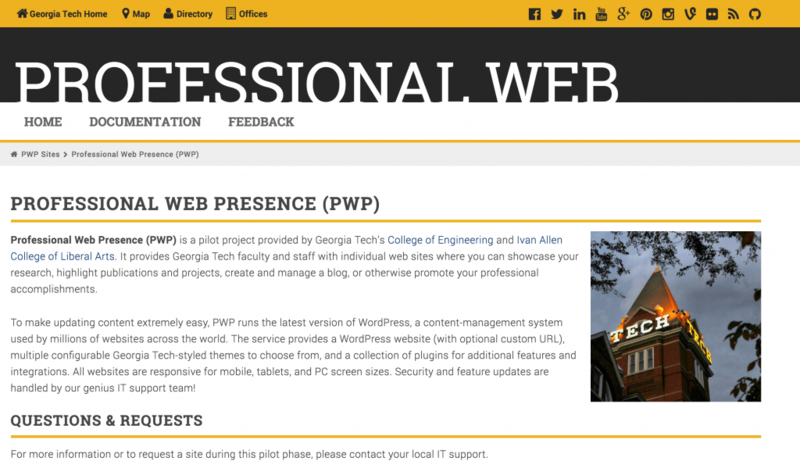 We’ve adapted styling and consistency from Georgia Tech’s Institute Communications design, while branching off a few features specifically for PWP-specific functionality. Georgia Tech Institute Communications has provided documentation about whether your website is available to use this theme variation. Please consult GTIC’s client managers for more information. Please note that PWP administrators cannot deter you from using this theme. We will forward you to GTIC for any queries on whether your website meets the requirements to use this theme variation. In v2.0, we have added all school logos from each of the colleges on campus. You can easily select your school or college logo from the dropdown in the Customizer. Please contact us to have your unit, laboratory, or Georgia Tech-approved logo included in this list. We will work with Georgia Tech Institute Communications to obtain the most up-to-date logos, incorporate the logo into the theme, and deliver an update to you with your logo available. 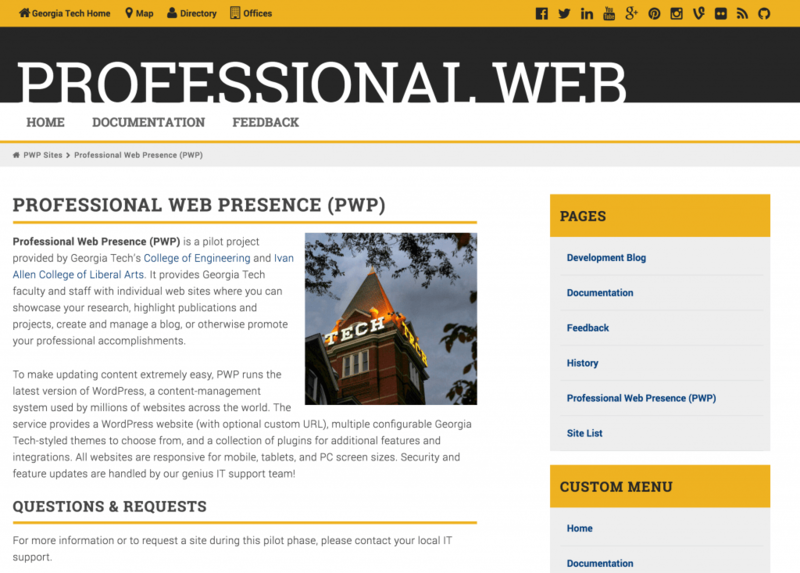 Previous Previous post: 300 Websites Hosted on PWP!